So it’s going to be good for brands. And good for getting some cheap things – free coffees, discounted fashion sure – but I just have a hunch that Facebook Deals is not going to be good for the chat. The banter. The conversation. You know what I mean. Sometimes people say really interesting things on Facebook. There are some great comment threads – there’s back and forth, conversations. I mean I guess that’s we all spend so long on the site in first place. 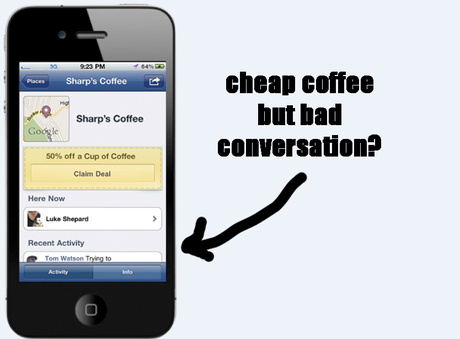 But never once in my experience has an interesting conversation developed on Facebook around the purchase of a latte. Maybe that will change. Maybe John will check into Topman, get 20% off a t-shirt, post a picture of it and it will spark off an interesting chat about his fashion taste. But getting £1 off a sandwich? Is that going to start a conversation? Would we want it to? Will we get a bit pissed off with daily notifications about people getting cut-price coffees every morning? Sure you can stop people appearing in your newsfeed, but say you like their status updates and just get fed up with the checkins? And from the other end — you may want £3 off a meat feast thin crust pizza but will you want to tell your friends everytime you get a discounted pizza? A quick whip-around of friends got a few comments like: “It’s kind of annoying when your friends try to sell stuff to you” and “meh, what? I only pay attention to the people I fancy on Facebook anyway.” mixed in with some enthusiasm about getting free stuff.